Even before I challenged myself to eat as locally as possible during the winter months, I favored the fruits and vegetables of cold months, eschewing zucchini and eggplant and tomatoes as summer fare. Citrus and celery fall into the chosen group. Citrus is obvious since it is abundant in the south. Celery maybe is less obvious, but on my list because of its association with carrots and onions (good keepers), as the aromatic base for European dishes. Celery, however, is one of the “dirty dozen,” foods most likely to retain – and therefore transmit to us – pesticides that treat them. As a result, I buy only organic celery, choosing mostly to rely on the Asian celery perennial in my garden for broths and on the (way too tough) stalks that are harvested (sometimes) from our CSA. All that said, I can’t resist a winter braise of Pascal celery, since cooked celery is a family favorite. While I normally braise celery on top of the stove, I chose the oven because the celery takes some time (over an hour) and I didn’t have the patience to babysit it. After washing the celery (it harbors dirt) and cutting the stalks to fit a buttered roasting pan, I chopped the tender tops and leaves along with some onion and sautéed them lightly in butter. I added the juice of an orange and a teaspoon of orange zest and let the liquid reduce. In went chicken broth, halfway up the volume of the celery stalks. Covered with foil, it baked in a slow oven until tender, over an hour! I cranked up the heat and topped the celery with coarse breadcrumbs tossed in orange zest, celery leaves, thyme and butter, to form a crispy crust. This had great textural and flavor contrasts. The silky and almost unctuous celery was sparked by the addition of the orange, an antidote to what promises to be a damp and chilly evening. You might notice that I added no salt. Celery is naturally high in sodium so I didn’t feel the need. The next time I make this, I might add chopped black olives cured in oil to the topping. Preheat the oven to 325 degrees. Butter a small casserole dish such as an oval Le Creuset enameled cast iron pan. Wash the celery well and remove any tough strings. Cut the base of the stalks in lengths to fit the pan. Chop the tender tops, including the leaves. Set about a tablespoonful of leaves aside. 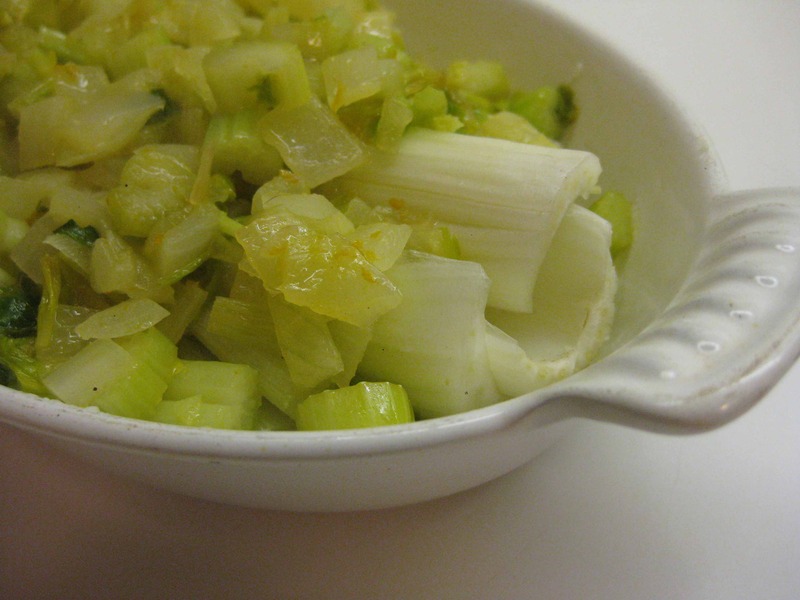 Saute the onion and chopped celery in butter until translucent. Add the orange juice and half of the orange zest, adding the other half to the reserved celery leaves. Let the orange juice reduce in the pan, and add 1/3 cup of chicken broth to warm it. Pour the liquid and vegetable mixture over the celery stalks, adjusting the liquid so that it comes about halfway up the sides of the stalks. Cover the pan with foil and bake in the oven for about an hour. Check the tenderness and continue to cook until the stalks are tender but not falling apart. Increase the oven heat to 425 degrees. Sauté the breadcrumbs in a little butter and toss them with the reserved celery leaves, orange zest and thyme. 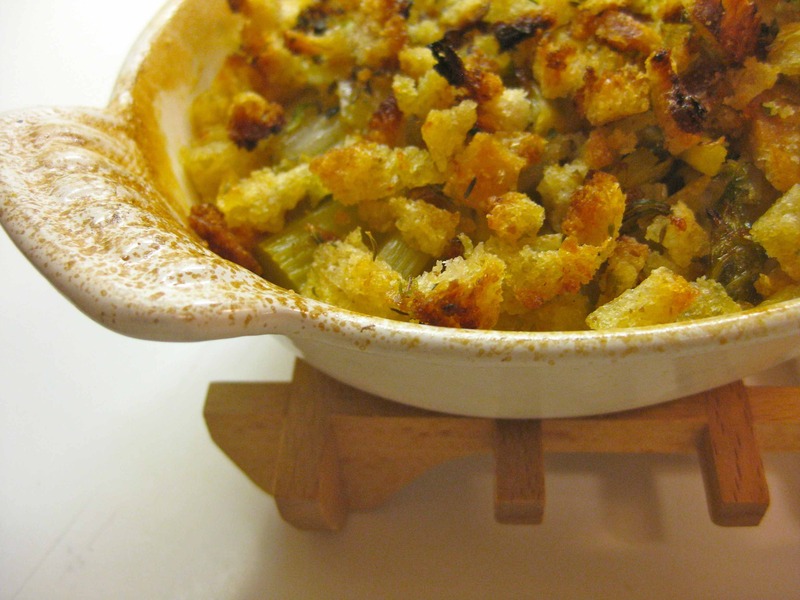 Spoon over the top of the celery and bake until the breadcrumbs are brown and crispy, about 7 minutes.